Great for teachers, home schooling parents, or any parent who needs to store large artwork created by their little artists, this Deluxe Bulletin Board Storage Pocket has it all! It’s made of durable fabric and clear vinyl for easy “see-through” reference and includes a hook and loop tape closure. 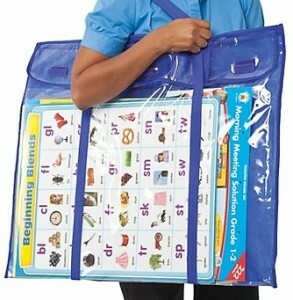 Measures 30″ x 24″ — a great size for storing bulletin board decorations, transporting large posters to school, or just keeping over-sized papers and posters clean and safe from dirt and cobwebs.